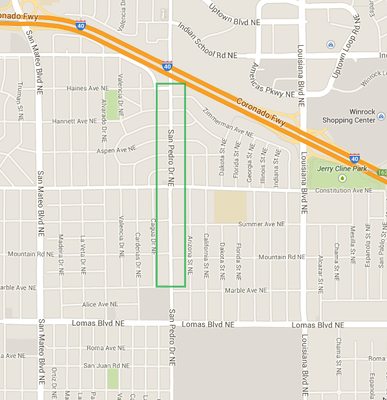 About the Mile-Hi District: San Pedro Drive between Marble Avenue and Haines Avenue. This project is important because it will improve safety along the corridor and help businesses thrive in the neighborhood. This project will revive the area with increased pedestrian safety, right-of-way reconfiguration & improvements, and the creation of a bicycle hub. 1/27/2014: R-14-146, legislation establishing the Mile-Hi District, is scheduled to be discussed at the City Council meeting on Monday, February 2, 2014. This project focuses on San Pedro Drive between Marble Avenue and Haines Avenue. View a map of this project. This project will improve access to San Pedro Drive between Marble Avenue and Haines Avenue for pedestrians & bicyclists, residents & businesses. Striping bike lanes on San Pedro Drive as part of the larger city-wide bike lane system without reducing motor vehicle capacity. Extending the bike boulevard along Mountain Street to connect to the multi-use trail system. Constructing a protected bike and pedestrian crossing at San Pedro Drive and Mountain Road. Constructing a portion of the 50 Mile Bike Loop along Alvarado Drive. Installing bike racks along the right of way. Improving access to local businesses by providing a protected left turn lane into the adjoining commercial centers. Creating an ‘area identity' of the "Mile-Hi District" by installing signage in the right-of-way, holding public, Mile-Hi events, and creating a web site. Installing street lights that illuminate both the street and the sidewalks. Improving the landscaping of the District. All dates tentative and subject to change. Summer of 2014: Project Team released October Draft Plan for public review. Summer and Fall of 2014: Meetings with business and property owners along San Pedro to review the planned improvements. Fall of 2014: Installation of Mile-Hi District identity signs. Fall of 2014: Decision made regarding the re-striping of San Pedro Drive. Fall of 2014 - Winter 2015: Design San Pedro re-striping, bike medians and other roadway improvements as necessary. Summer of 2016: Design lighting improvements. Late Fall of 2016 to Winter 2017: Install lligthing improvements. Since its development in the 1950’s this almost mile-long segment of San Pedro Drive between Haines Avenue and Lomas Boulevard has been a quintessential island of “Main Street USA” within a growing urban sea as housing subdivisions marched east from Interstate 25 to the foothills of the Sandia Mountains. In recent years significant vacancies and disinvestments have occurred. But through the efforts of neighborhood residents, merchants, and landlords the area is coming back to life as a junction where different cultures and lifestyles create the energy that forms eclectic urban communities.